Michael White and Peter Thompson at Ocean Independence and Jim Eden and Michael Mahan at Worth Avenue Yachts send simultaneous emails about a $5.4 milion price drop on the 54.9 motor yacht Harbour Island. The first hull of the Newcastle 5500 series from Newcastle Shipyards, she was launched in August 2011. Exterior styling is by Murray & Associates and interior design by Claudette Bonville. ABS classed and MCA compliant, Harbour Island is a six-stateroom yacht featuring two king master suites, one on the main deck and one on the skylounge deck forward plus a VIP king guest stateroom below. Additional amenities include an infinity pool on the split-level sundeck, a raised veranda on the main aft deck and an expansive built-in seating area aft of the alfresco dining area on the skylounge aft deck. 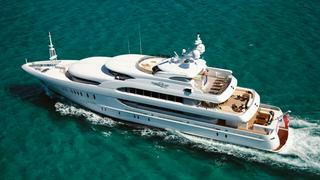 A finalist at the 2012 World Superyacht Awards and on display at the Fort Lauderdale show, Harbour Island is down from $54.9 million to $49.5 million.